Wow! It’s May already. It’s come around so fast. We’re nearly half way through the year. Time to update my wall calendar. You can use snaps of your own, family and friends, or use it as a mini mood board for the month. What’s your mantra for May? This entry was posted in blogs, Fun, House Of Turtle, Inspiration and tagged calendar, Fashion, Fun, inspiration, kikki.K, May, sass & bide, stationery by houseofturtle. Bookmark the permalink. 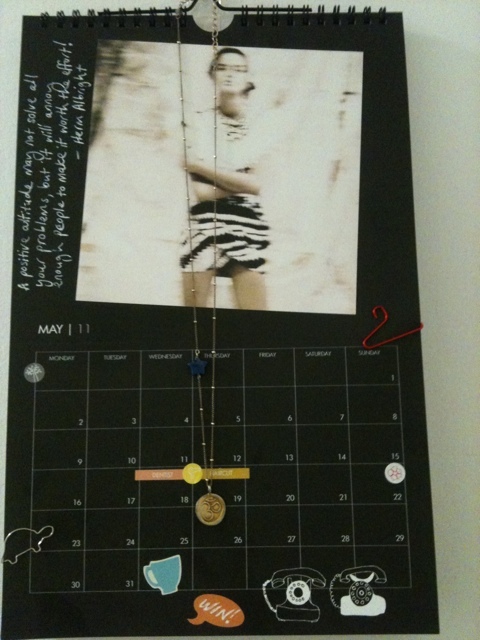 Wow, what a gorgeous example of our DIY calendar! Thanks so much for sharing this with us. We always get a buzz when we see our products in action. Keep us posted on your design for next month! This blog may induce a desire to go shopping, depart with hard earned cash or rack up credit card debt. It may invoke a serious case of 'want' - a complex obsession that will override everything else. Enjoy!